If you record to a track which already contains data the new part becomes a partial take. The recorded part appears as a tweakable edit in the track's editor, so you can move and resize it to make it fit if necessary. The track editor can also be used to undo the recording. After undoing the file containing the partial take is still available from the track's File Options menu. If it's an audio track an .aem file will be created if the track isn't using one already. 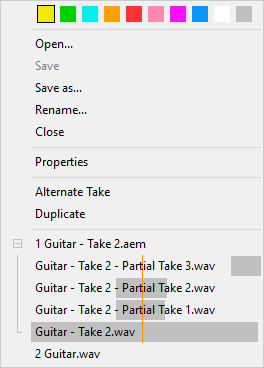 Partial takes appear on the track's file options menu if the take they're recorded in is expanded (see picture). Clicking one will open it in a new track. The menu shows which part of the song is covered by a partial take in gray. The vertical blue line represents the current transport position. Partial audio take files are BWF (Broadcast Wave File) files. This is a .wav file with additional information on where the starting point is. MultitrackStudio discards the bext chunk unless the words "MultitrackStudio Partial Take" are in the Description field. Partial MIDI take files are just plain MIDI files.